MaxLaxOC.com is please to introduce Peak Mouth Guards to our readers. Peak Mouth Guards is one of the sponsors that help keep local lacrosse news coming your way. Locally owned and operated by Mission Viejo dentist Dr. Richard O’Braitis, Peak Mouth Guards provides custom-fit and custom-designed mouth guards for athletes of all sports. Dr O’Braitis has fabricated thousands of custom-fitted sports mouth guards for athletes ages five and up since 2004. His happy customers include two State Championship High School football teams, as well as numerous C.I.F. and league champions. One of the greatest influences has been the level of safety that Peak Mouth Guards provides for lacrosse players. 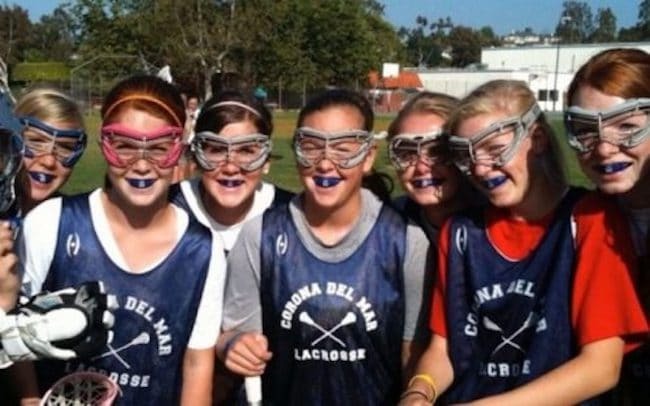 Lacrosse’s unique level of action, contact, need for precise communication and elevated endurance is the ideal sport for using a custom mouth guard. Peak Mouth Guards exact fit to the player’s mouth keeps the mouth guard in place throughout the game or at practice. Proper fit prevents gagging, irritation to the gum as and tissue, and removes the annoying desire to chew on the custom fitted Peak Mouth Guard. Speech is never a problem due to excellent fit and the polished shape on the inside of the teeth. “My daughter plays keeper for Mission Viejo HS Lacrosse. Protecting her teeth is very important to us. Sarah was fitted for a professional sports mouth guard and we couldn’t be happier. It was done quickly and professionally with her name, team name, school logo and colors. SHE LOVES IT ! WE LOVE IT TOO BECAUSE IT PROTECTS HER TEETH,” Bonnie D.
“I love having my professional custom fitted mouthpiece. I like when the mouthpiece firmly molds to your mouth. I also like how you CAN TALK NORMAL WITHOUT MUMBLING A LOT. Thank you so much.” Cole S.
Order Your Peak Mouth Guard Today at www.peakmouthguards.com.